Department of Spine Surgery, Ganga Hospital, 313, Mettupalayam road, Coimbatore, India. Department of Spine Surgery, Ganga Hospital, Coimbatore, India. Classification systems of throcolumbar fractures have undergone many changes. From being completely descriptive to predicting prognosis and helping in decision making. An ideal system should be simple, reliable, comprehensive, and reproducible, should facilitate communication between surgeons and also guide the treatment. This review provides an overview on the evolution of various classification system & discusses the merits of the current systems. Thoracolumbar (TL) region is defined as the region between T10- L2 vertebral bodies  .The fractures of the thoracolumbar region constitute a spectrum of injuries ranging from simple undisplaced stable fracture to an unstable fracture dislocation. Injuries in this region are more common as it is transition zone between kyphotic thoracic region and the lordotic lumbar region, also transits from stiff thoracic spine to a mobile lumbar spine along with the change of orientation of facet joints from coronal to sagittal .In addition, the location of the body’s center of gravity anterior to the body causes compression forces to be transmitted to the anterior vertebral bodies & distraction of the posterior elements [1,2]. Bohler first classified TL fractures eight decades ago, which was followed by multiple fracture classifications . Though there are various classification systems there is no consensus on which is the most applicable. The various classification systems has been described based on the mechanism of injury , morphology of the fracture , two or three column injuries including posterior ligamentous complex and presence of neurological deficit . The complex vertebral anatomy and ligamentous structures are to be included into the fracture classification making it difficult to classify. Occurrence of new pattern of injuries and advanced investigations create a lacunae in previous classification. Fracture pattern depends on the mechanism of injury and the forces acting at specific position of spine. Rationale of stability of TL fractures is the one which dictates the treatment. The concept of stability has varied from posterior ligamentous complex injury, two column concept, and three column concept and scoring systems with time. Plain radiographs & computer tomography (CT) are the investigative modality of choice for evaluating TL fractures. Even though MRI might be able to image the posterior ligamentous complex, its role in TL fractures is still not well defined. MRI is definitely indicated when there is disparity between the neurological level of injury and skeletal injury, and in patients with worsening of neurological deficit after admission. MRI may also have a role in evaluating the posterior ligamentous complex to differentiate between a stable or unstable burst fractures. Rajasekaran et al concluded that the MRI did offer modest gain in sensitivity in Posterior ligament complex (PLC) injuries but did not support the need for routine MRI for classification in assessing instability or need for surgery [ 4,5]. The classification systems are based on static images of the spinal injuries. The available imaging techniques are taken in supine position which cannot identify reduced thoracolumbar subluxation as well as the extent of deformity. An ideal system should be simple, reliable, comprehensive, and reproducible, should facilitate communication between surgeons and also guide the treatment. This review provides an overview on the evolution of various classification system & discusses the merits of the current systems. First description of Thoracolumbar fractures in 1930 which was mainly descriptive based on plain radiographs . Classified into five categories: compression, flexion- distraction injury, extension, shear fractures and rotational injuries. First classification to highlight the importance of posterior ligamentous complex (PLC). Described seven fracture types of which three are essential : simple wedge , comminuted fracture and fracture- dislocation. Holdsworth mechanistic classification revolutionized the classification system by introducing the concept of two columns .Spine was divided into two columns :anterior (vertebral body and intervertebral disc)and posterior (neural arch and posterior ligamentous complex)[Figure 1]. Based on the injury pattern he divided spinal fractures into five types: pure flexion, flexion rotation, extension, vertical compression or direct shearing force. The involvement of both the columns rendered the spine unstable . Bohler was the first to give a descriptive classification of TL fractures. Later Watson Jones introduced the concept of instability and attributed it to PLC injury. Nicoll stated that integrity of interspinous ligament is important for spinal stability. Holdsworth introduced the concept of columns and stated that the involvement of the posterior column renders the spine unstable . All these classifications are simple and state fracture patterns but are not predictive of outcome . Three column concept of Denis redefined the fracture pattern and classification of TL injuries. Computer Tomography (CT) analysis was done which helped to look more clearly into the fracture anatomy and patterns. Denis divided spine into three columns : Anterior, middle and posterior. Compression fractures: Failure of the anterior column under compression. Denis highlighted the importance of neurological status and described three forms of instability by degrees. The first degree corresponds to isolated mechanical instability, second-degree includes injuries with neurologic component but no mechanical instability and third degree refers to injuries with mechanical and neurologic instability. Denis classification is simple and highlights the relationship between neurologic injury and stability ,but it did not distinguish between stable and unstable patterns. Middle column as described by Denis is not an anatomical part but is an arbitrary division in the vertebral body itself. It has moderate inter -observer reliability and also does not predict outcome. McAfee based on study of 100 consecutive patients categorized the failure of the middle column into one of the three modes : axial compression, axial distraction & translation. • Stable burst fracture : Anterior and middle columns fail in compression with no loss of integrity of the posterior elements. • Chance Fracture : Horizontal avulsion injury of vertebral body as result of flexion about an axis anterior to the longitudinal ligament. • Flexion-distraction injury : Compressive failure of the anterior column while the middle and posterior columns fail in tension. • Translational injuries : Complete disruption of neural canal which shear failure of all three columns. Wedge compression and stable burst fractures are stable and can be treated conservatively. Vertebral body height loss more than 50 %, kyphosis > 30 , facet joint subluxation, progressive neurological deficits and spinal canal occlusion by bone fragments in a CT with existence of incomplete neurological deficits were defined as instability criteria. According to these criteria all translational injuries, fracture dislocations , posterior ligamentous injuries with kyphosis greater than 30 degrees are unstable injuries and will need surgery . This classification is one of the most popular and practical which is still in use in clinical practice . First point based classification system to guide the treatment patterns based on score. Based on communition ,apposition and kyphosis reduction point scoring system was used for quantification [Figure 3]. McCormack et al. introduced this classification to predict the risk of implant failure after posterior short segment fixation for thoracolumbar fractures and was mainly applicable to Burst fractures . They proposed score greater than 7 points has greater failure rates with short segment fixation and requires anterior fixation. The scoring system, mainly focuses on vertebral body fractures rather than posterior ligamentous complex and is not related to mechanism of injury. Thus this classification system is an adjunctive tool especially in burst fractures but cannot replace other classification systems . Li- yang Dai et al have shown a high level of interobserver & intraobserver reliability of load sharing classification in assessment of tharacolumbar burst fractures . This classification has lost its significance in the recent years due to the increased use of “intermediate screw concept (pedicle screw in the fractured vertebral body ) in the surgical management of Burst fractures . 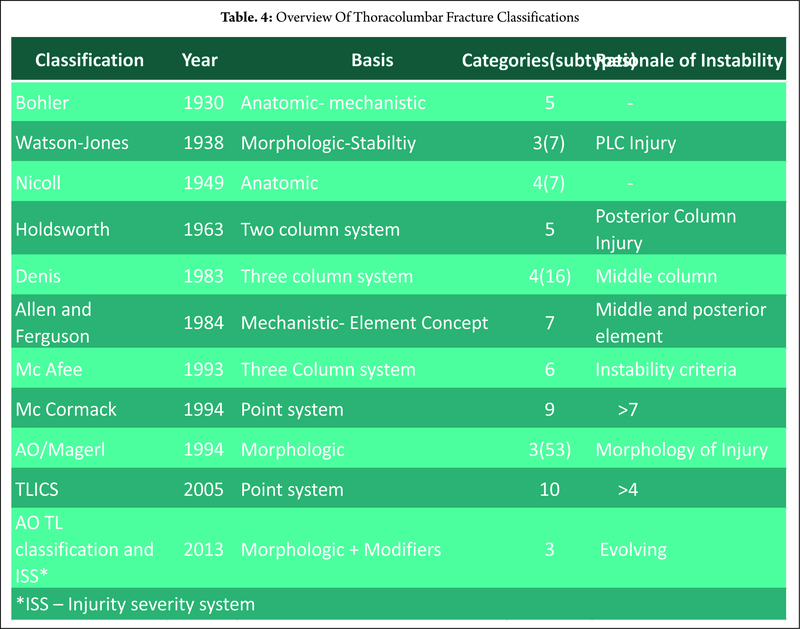 Magerl in 1994 after an extensive analysis on 1445 cases came with a comprehensive classification which defines all the fracture patterns of TL injuries. Two column concept has been highlighted and was used for description of TL fractures. This is a complete classification which not only incorporates the mechanism of injury but also defines the fracture pattern. 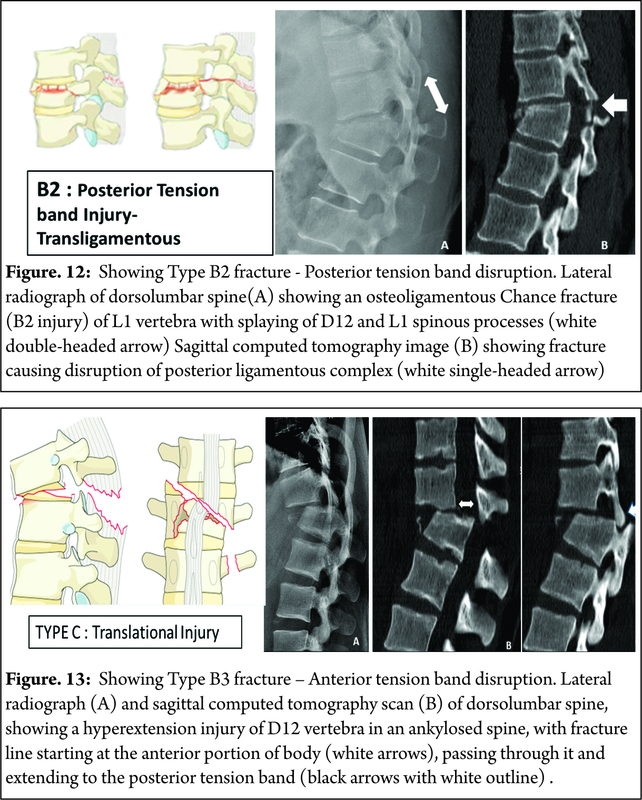 The classification proposes three types of injury mechanism: compression (type A), distraction (type B) and torsion (type C) [Figure 4]. They defined the fractures based on severity starting from simple patterns to more complex ones. Stability was also addressed by this fracture classification stating simple fractures as stable and complex ones as unstable. Though it defines the fracture in a more extensive way with total of 53 subtypes, this makes it complex and difficult. Despite widespread usage of the AO/Magerl classification, it has lower inter-observer reliability and is less useful in therapeutic decision making and prognostic purposes .Blauth et al. have reported that the inter-observer reliability of the AO classification was low (fair agreement, κ = 0.33), and when the injury was classified into subgroups, the inter-observer reliability decreased further. Oner et al. and Wood et al. have also reported that the Denis classification system (κ= 0.60 and 0.606) showed higher inter-observer reliability than the AO classification system (κ = 0.35 and 0.475)[10,17]. Neurologic injury is not addressed, which is a drawback to this classification. This classification has recently been simplified by the AO Spine Knowledge forum and will be discussed later. Spine Trauma study group came with a new classification system in 2005 that was designed to depict the features important to predict spinal instability, future deformity & progressive neurologic compromise . To guide a treatment protocol, they designed a 10 point scoring system considering three principal parameters- Injury morphology, Posterior ligamentous complex (PLC) status and neurological injury [Table 2] .The PLC includes the supraspinous ligament ,interspinous ligament ,ligamentum flavum & the facet joint capsule . A score less than 4 indicates non-surgical treatment, while a score greater than 4 indicates the need of surgical treatment because of significant instability. A total score of 4 may be treated either surgically or non-surgically. Though this system predicts outcome, the validation studies are performed by the authors which questions the reliability. Moreover the major determinants taken into consideration are independent of each other which may sometimes misguide treatment. MRI is needed for knowing the integrity of PLC which is one of the limitation to this classification. Comparing the reliability of Denis, AO, and TLICS systems Lenarz et al. and observed that in all the three systems variation in reliability was present . They noted the highest reliability in the senior resident group and attending spine surgeon group and the lowest reliability in the non – spine attending orthopedists and junior residents. The highest inter observer and intraobserver reliability was noted for the neurologic status. They concluded that the TLICS is an acceptably reliable system when compared with the Denis and AO systems. Joaquim et al in a retrospective case series noted that the TLICS score treatment recommendation matched the surgical treatment in 47 of the 49 patients studied . This is based on Magerl classification which is modified by the AOSpine Knowledge forum.and is based on mode of failure of the spinal column [ Figure 5]. Involve anterior element fracture without PLC involvement. They are subdivided into five subtypes [Figure 6]. These subtypes are used in description of vertebral body fractures in B and C types. These fractures are characterized by displacement of the cranial or the caudal vertebral fractures segments in any plane ( any translation injury ) [Figure 14]. No subtypes are classified due to possibility of various configurations. Any associated vertebral body fracture should be specified separately ( eg : A1, A2, A3 , A4). Any associated posterior tension band injuries should be specified separately (eg: B1,B2, B3). NX : Neurologic status is unknown due to sedation or head injury. We propose the following factors to be considered based on AO classification system for the management of TL fractures. Plain radiographs and CT are absolutely essential to classify the factors. MRI may be usual to identify PLC injury & hence in diagnosis of B2 type injuries. Simple fractures like TYPE A0, A1, A2 can be treated conservatively. Type B and C are better treated by surgical method. Management of A3 & A4 fractures depend on the presence of neurological deficit , kyphosis , communition and patient modifiers. Posterior ligamentous complex plays an important role in long term functional outcome. Clinical findings like severe tenderness and palpable posterior gap suggests PLC injury. Radiological signs such as widening of interspinous distance, facet disruption, Local Kyphosis > 20 and vertebral body comminution to be considered as indicators of associated PLC injury.Surgical management is advised in such situations. Patients with neurologic injury must be surgically treated with or without direct decompression. The choice of surgical approach & technique has not proved to have any impact on the clinical and radiological outcome, hence currently there is no definitive recommendation . It depends on the training , center, & the understanding & beliefs of the surgeon . The classification of TL fractures has been evolving over the last 9 decades. There is no universally accepted classification so far to guide the treatment. Historically McAfee, AO/Magerl and Load sharing classification had been widely in use but none proved flawless. TLICS came with scoring system which guides treatment and predictor of outcome which is widely in use but had its own pitfalls.. The AO spine thoracolumbar classification system and its attempt at developing a injury severity scoring system is the most recent and the promising classification so far . The AO spine thoracolumbar classification system should be able to guide treatment and predict the outcome to overcome the pitfalls of other classifications. However clinical experience and clinical scenario should not be outweighed by these classification systems to guide the treatment. 1. Stagnara P, De Mauroy JC, Dran G, Gonon GP, Costanzo G, Dimnet J, Pasquet A. Reciprocal angulation of vertebral bodies in a sagittal plane: approach to references for the evaluation of kyphosis and lordosis. Spine. 1982 Jul 1;7(4):335-42. 2. Smith HE, Anderson DG, Vaccaro AR, Albert TJ, Hilibrand AS, Harrop JS, Ratliff JK. Anatomy, biomechanics, and classification of thoracolumbar injuries. InSeminars in Spine Surgery 2010 Mar 31 (Vol. 22, No. 1, pp. 2-7). WB Saunders. 3. Boehler L. Die techniek der knochenbruchbehand¬lung im grieden und im kriege. Vienna: Verlag von Wilheim Maudrich; 1930. 4. 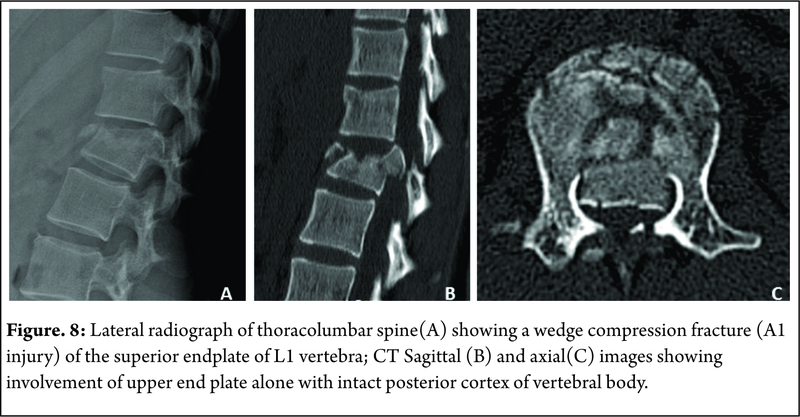 Rajasekaran S, Vaccaro AR, Kanna RM, Schroeder GD, Oner FC, Vialle L, Chapman J, Dvorak M, Fehlings M, Shetty AP, Schnake K. The value of CT and MRI in the classification and surgical decision-making among spine surgeons in thoracolumbar spinal injuries. 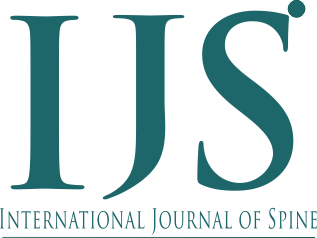 European Spine Journal. 2016 Jun 1:1-7. 5. Rajasekaran S, Maheswaran A, Aiyer SN, Kanna R, Dumpa SR, Shetty AP. Prediction of posterior ligamentous complex injury in thoracolumbar fractures using non-MRI imaging techniques. International orthopaedics. 2016 Mar 17:1-7. 6. Watson-Jones R. The results of postural reduction of fractures of the spine. J Bone Joint Surg Am. 1938 Jul 1;20(3):567-86. 7. 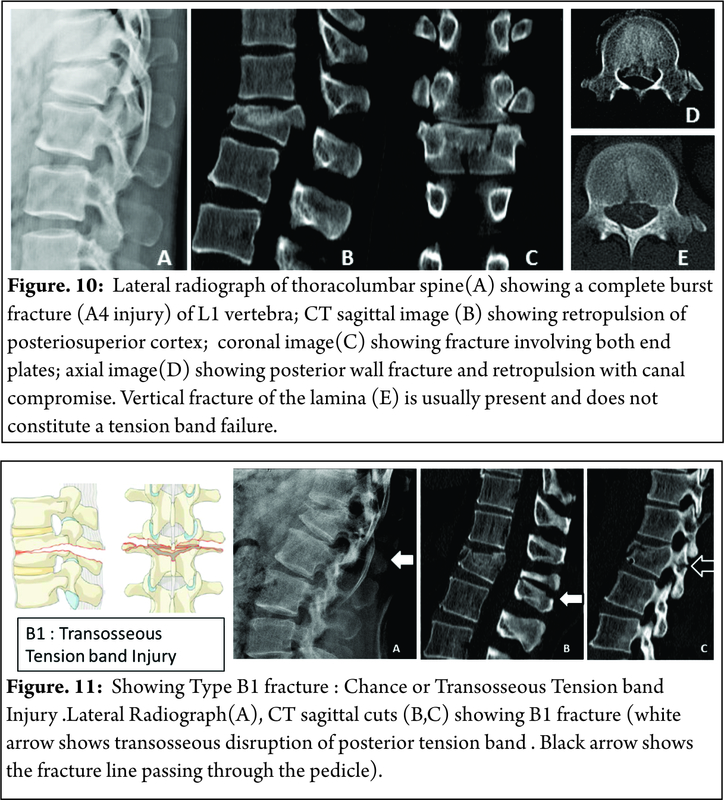 Holdsworth F. Review article fractures, dislocations, and fracture-dislocations of the spine. J bone joint surg Am. 1970 Dec 1;52(8):1534-51. 8. Verlaan JJ, Diekerhof CH, Buskens E, Van der Tweel I, Verbout AJ, Dhert WJ, Oner FC. Surgical treatment of traumatic fractures of the thoracic and lumbar spine: a systematic review of the literature on techniques, complications, and outcome. Spine. 2004 Apr 1;29(7):803-14. 9. Denis F. The three column spine and its significance in the classification of acute thoracolumbar spinal injuries. spine. 1983 Nov 1;8(8):817-31. 10. Oner F, Ramos L, Simmermacher R, Kingma P, Diekerhof C, Dhert W, Verbout A. Classification of thoracic and lumbar spine fractures: problems of reproducibility. European Spine Journal. 2002 Jun 1;11(3):235-45. 11. McAfee PC, Yuan HA, Fredrickson BE, Lubicky JP. The value of computed tomography in thoracolumbar fractures. An analysis of one hundred consecutive cases and a new classification. J Bone Joint Surg Am. 1983 Apr 1;65(4):461-73. 12. McCormack T, Karaikovic E, Gaines RW. 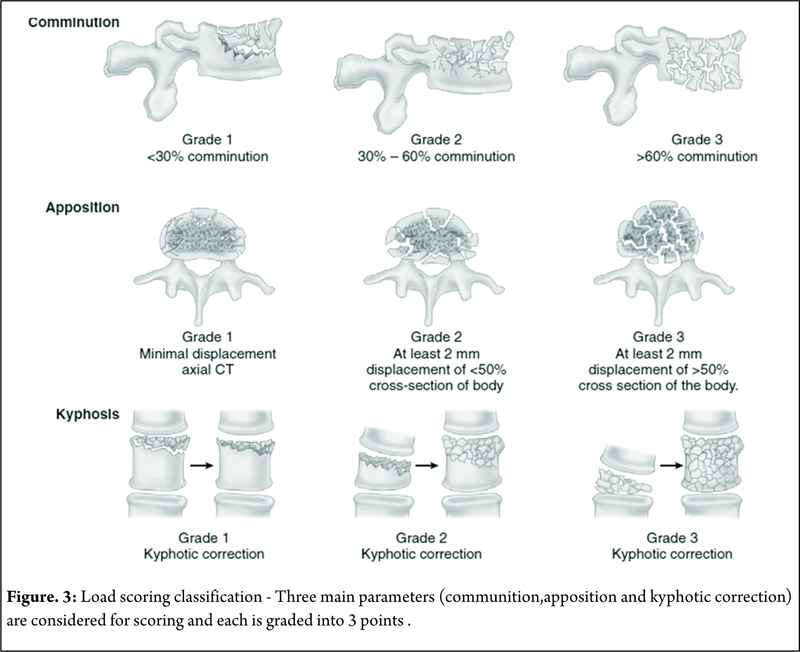 The load sharing classification of spine fractures. Spine. 1994 Aug 1;19(15):1741-4. 13. Dai LY, Jiang LS, Jiang SD. Conservative treatment of thoracolumbar burst fractures: a long-term follow-up results with special reference to the load sharing classification. Spine. 2008 Nov 1;33(23):2536-44. 14. Shen WJ, Liu TJ, Shen YS. Nonoperative treatment versus posterior fixation for thoracolumbar junction burst fractures without neurologic deficit. Spine. 2001 May 1;26(9):1038-45. 15. Magerl F, Aebi M, Gertzbein SD, Harms J, Nazarian S. A comprehensive classification of thoracic and lumbar injuries. European Spine Journal. 1994 Aug 1;3(4):184-201. 16. Blauth M, Bastian L, Knop C, Lange U, Tusch G. [Inter-observer reliability in the classification of thoraco-lumbar spinal injuries]. Der Orthopade. 1999 Aug;28(8):662-81. 17. Wood KB, Khanna G, Vaccaro AR, Arnold PM, Harris MB, Mehbod AA. Assessment of two thoracolumbar fracture classification systems as used by multiple surgeons. J Bone Joint Surg Am. 2005 Jul 1;87(7):1423-9. 18. Vaccaro AR, Lehman Jr RA, Hurlbert RJ, Anderson PA, Harris M, Hedlund R, Harrop J, Dvorak M, Wood K, Fehlings MG, Fisher C. A new classification of thoracolumbar injuries: the importance of injury morphology, the integrity of the posterior ligamentous complex, and neurologic status. Spine. 2005 Oct 15;30(20):2325-33. 19. Lenarz CJ, Place HM, Lenke LG, Alander DH, Oliver D. Comparative reliability of 3 thoracolumbar fracture classification systems. Clinical Spine Surgery. 2009 Aug 1;22(6):422-7. 20. Joaquim AF, Fernandes YB, Cavalcante RA, Fragoso RM, Honorato DC, Patel AA. Evaluation of the thoracolumbar injury classification system in thoracic and lumbar spinal trauma. Spine. 2011 Jan 1;36(1):33-6. 21. Vaccaro AR, Oner C, Kepler CK, Dvorak M, Schnake K, Bellabarba C, Reinhold M, Aarabi B, Kandziora F, Chapman J, Shanmuganathan R. AOSpine thoracolumbar spine injury classification system: fracture description, neurological status, and key modifiers. Spine. 2013 Nov 1;38(23):2028-37. 22. Kepler CK, Vaccaro AR, Schroeder GD, Koerner JD, Vialle LR, Aarabi B, Rajasekaran S, Bellabarba C, Chapman JR, Kandziora F, Schnake KJ. The Thoracolumbar AOSpine Injury Score. Global spine journal. 2016 Jun;6(04):329-34. 23. Kaul R, Chhabra HS, Vaccaro AR, Abel R, Tuli S, Shetty AP, Das KD, Mohapatra B, Nanda A, Sangondimath GM, Bansal ML. Reliability assessment of AOSpine thoracolumbar spine injury classification system and Thoracolumbar Injury Classification and Severity Score (TLICS) for thoracolumbar spine injuries: results of a multicentre study. European Spine Journal. 2016:1-7. How to Cite this Article: Shetty AP, Dumpa SR, Rajasekaran S. Thoracolumbar Fractures: Classification and Clinical Relevance.. International Journal of Spine Sep-Dec 2016;1(2):14-21.